We received the following letters within a week of each other. The first is typical of many requests for advice and information that come in from first-time rabbit-people across the country. Time and space limitations make it impossible for us to answer or publish all these letters individually. Because the rabbit mentioned in the letter also wrote to us, we felt it was an ideal opportunity to open up the lines of communication between these two parties. I also have a question about Libby and wonder if anyone else has come across this problem:I have 2 stepkids who visit once or twice a week. They have their own bedroom where for now they sleep on sleeping bags on the floor. I have to be very careful to keep the door closed because each time it's left open Libby (who has the run of the house most of the time) will leave droppings and pee all over their things. At first we thought it was because Libby was upset that the kids chased him around, because he is trained to only go in his cage or outside and hasn't gone inside anywhere else, but why does he go in there every chance he gets when they no longer chase him? I need a rabbit psychiatrist! Help! My humans are driving me crazy! Daphne of Oakland spread the word on the rabbit grapevine that you have some people who speak Rabbit at your office, so I'm writing in desperation, searching for a translator. Could you please tell my human the following: I have not recovered from the misery and terror of being pursued by those small ones who stay here occasionally. I honestly don't know how long it will be before my heart stops racing at the mere thought of them. There's nothing more terrifying than an enemy whom you never know when to expect. I'll have just started to calm down from their previous attack, and the house will have some kind of recognizable routine-please tell her how important routine is for me! !-and then they appear again. How ever am I to establish patterns of my own, such as toilet habits, etc., when my environment is so topsy-turvy and frightening? Could you also please tell her that I need more than one toilet area in the house. Remind her that I'm not very big, and it's easier if I don't have to go too far to get to a litterbox. If she could also put a little handful of hay in each box -well, I'd be thrilled. Maybe when those small humans come here, she could confine them to a single room, at least until they're trained. If that's not possible, could she please confine me to a single room, and not let the little humans into that room until they're trained? Either way is fine, as long as there's a sanctuary for me, one that contains my cage, a litterbox or two, my food and water, a few toys, and maybe a cardboard box for extra hiding and security. I hope that's not asking too much. I admit I'm very much a creature of habit. I'm at the point now that I'll mark the little human's possessions today simply because I did it yesterday. I may need a little help to get free of this habit; I'm sure if I just kept away from their stuff for a month or so, that would do the trick. Now that I think about it, I guess my fear of the little loud humans is partly habit, too. I don't know the ways of humans well enough to say what it is they do when they feel nervous and insecure. With us, nothing refreshes our sense of "I live here" more than our own scent. When everything around me is confusing, I'll leave some droppings or urine to help me feel at home. Sometimes if I do this right at the heart of a place that scares me, it takes away some of the fear. Having heard from both parties, we hope that Libby's requests will be met, as they have been shown to work with other rabbits in similar situations. One important point that wasn't covered in either letter is Libby's reproductive status. His human refers to him as a "buck," which may mean he's not been neutered. If that's the case, then certainly at the top of the list should be surgery by an experienced rabbit vet, a topic covered in detail in previous issues of HRJ. Neutering can help reduce the need for territorial marking, although stress will bring it on even in an altered rabbit. And as Libby points out, habit plays a large role in rabbit (and human) behavior. The older the rabbit is at neutering, the more ingrained certain habits such as marking may be. 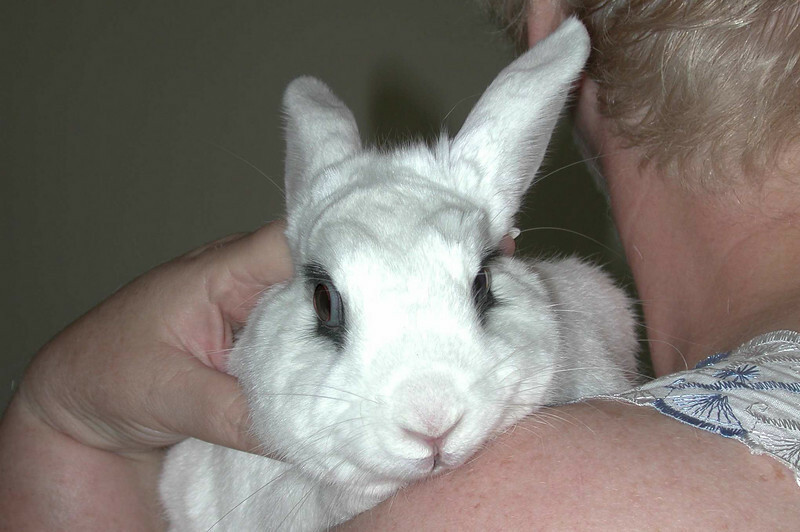 Neutering will still help, although the desired changes may take a little longer than in a young rabbit. Sometimes breed categories ("Holland Lop buck") can actually work against the process of human and rabbit getting to know each other. The way we humans tend to focus on breed designations in other species can become an opaque and unnecessary wall that we erect between ourselves and them. We don't need to know Cathy's pedigree in order to understand her letter. In the same way, the facts that Libby is very small and has ears that go down instead of up are irrelevant. Regardless of his physical appearance, or his genetic makeup, Libby needs some structure in his life, some peace and quiet, a safe haven, possibly surgery,and a few more litterboxes. This same reasoning applies in terms of the writer's question about which "types" of rabbits "have the best personalities." Aside from the fact that "best" is a subjective judgement, it's also important to realize that personality is not exclusively or even primarily related to breed. One way to clarify this concept is to switch species for a moment: Which type of human has the best personality? Libby is Libby first, and a Holland Lop second. The best personality is the one with whom a particular human is able to develop a mutually satisfying relationship. And Libby's preferences in this area need to be addressed as well. A rabbit friend for your rabbit is almost always a good idea, as long as the two are spayed/neutered and fond of each other. One possible clue to the communication problem between these two comes in Cathy's remark that she acquired Libby "after being dissatisfied with owning several guinea pigs." Dissatisfaction usually indicates expectations that were not met. Because we do in fact "own" the animals in our care, we sometimes forget that our relationship with them requires compromise on both sides, just as between two humans. This sometimes requires that we humans examine our preconceptions and expectations in the light of the actual animal before us. A little attitude adjustment can make the difference between friendship and abandonment. We hope that these communiques across species boundaries will help not only Cathy and Libby but also other rabbits and humans who are trying to understand each other and to share each other's world.